The 16-year-old girl arrested by the Israeli army two weeks ago has become a symbol of Palestinian resistance. With curly, thin, brave hair, that’s the image of Ahed Tamimi, the 16-year-old girl arrested by the Israeli army two weeks ago who has become a symbol of Palestinian resistance. An Israeli military court charged the teenager with 12 crimes after the incident in which she slapped a Zionist army soldier after he entered her backyard. Thanks to his family’s filming of the events, images of his resistance went around the world. Tamimi is one of many minors arrested by the Zionist army for the purpose of being “interrogated” about alleged illegal activities. 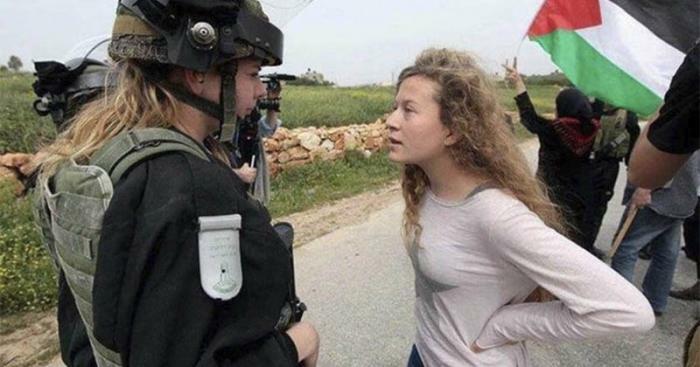 Army spokesmen confirmed that Ahed is charged with “assaulting a soldier”. “She argued with the Zionist Defense Forces because her cousin Mohammad, 15, had been shot,” her father said. The Israeli version is that they were “throwing stones”. According to the Committee for Palestinian Prisoners’ Affairs, the number of Palestinians detained by Israeli security forces since US President Donald Trump declared Jerusalem the capital of Israel on 6 December has risen to 610, including 170 minors. The young woman lives in Nabi Saleh, 20 kilometers from Ramallah in the occupied West Bank. He claims he wants them to see them as fighters, not victims. “Ahed says she does what any Palestinian child does, but she is filmed,” her father said in an article in the Haaretz newspaper. “I do not want to be identified as a victim, and I will not give your actions the power to define who I am and will be. I choose to decide for myself how you will see me. We don’t want your support because of photogenic tears, but because we choose the fight and the fight is fair. This is going to be the only way we will ever stop crying,” wrote the father, reproducing Ahed’s words. Tamimi is already an international heroine of the Palestinian cause and after her arrest her mother and cousin were also arrested. The arrest of the Tamimi family was like the fire that awaited the sleeping powder of the international community to react. For days now, social networks have been flooded with messages calling for the release of mother, daughter and cousin, under the labels #FreeAhedTamimi and #LibertadAhedTamimi. Palestinian President Mahmoud Abbas called Ahed’s father, Basem Tamimi, a Fatah militant, and praised the family for “the key role” in the protests in his people against the Israeli occupation and settlements, according to an official statement. “I can’t think about the future because the Israeli occupation prevents me from thinking about it. When I went to play in the streets, the army would come in and start shooting,” she said. The international campaign for the liberation of Ahed Tamimi is a new flag against imperialist policy in the Middle East and highlights the crimes committed by the Zionist regime.